"Where My Wife Spends Most of Her Time..."
I'm sure other people said this, but this is tilted. I think it would be nicer if it were level. In the gutter? I think I'd be more careful how I title photos in a public forum! The title is interesting. "Where my wife spends most of her time" at the alley or in the gutter. lol. Good composition. I like that you used a vertical composition. Gives you a sense of the length of the alley. Needs to be straightened a little bit. You were able to capture some really nice colors. I like how the reflections are very vivid. Usually bowling alleys have bad lighting, but you were able to get a great shot here. Nice clean shot - slightly tilted though. 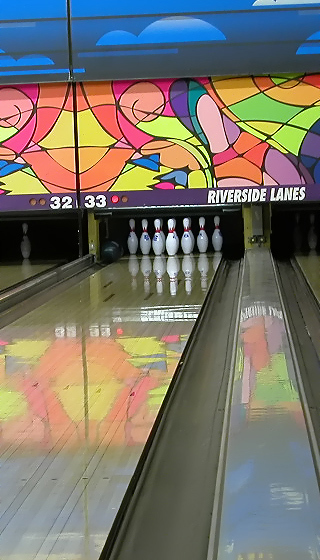 It's a shame you couldn't have got an action shot of the ball with pins being knocked over. Two things: 1) It's tilted WAY to far to the left. This is such a basic problem, I'm surprised how many people don't even notice it. 2) You should have lowered your angle to maybe a foot off the floor. That would give it a much better perspective. I like the colors in the shot however. I hope you were referring to the bowling alley. . . not in the gutter! Nice image and very colorful, too bad the horizon isn't level. This one has a lot of potential with all of the colors -- I may have just tried a little different angle. This version seems just a bit tilted, for one thing. I might have tried putting the camera right on the floor of the alley in the middle to give a little different perspective. Like to colours, but maybe a ball in there would have brought this shot to life. Bit wonkey too. Hmmmm. I look at the title and then the picture and I say your wife spends most of her time in the Gutter??????? Proudly hosted by Sargasso Networks. Current Server Time: 04/21/2019 02:10:01 AM EDT.